The Ottawa Senators have acquired Derick Brassard and a 2018 7th-round draft pick from the New York Rangers in exchange for Mika Zibanejad and a 2018 2nd-round pick. Both players involved in the deal are former first-round picks. 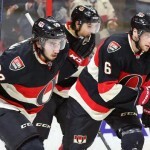 In fact, both Brassard and Zibanejad were selected with the sixth overall pick in their respective drafts (Brassard in the 2006 NHL Entry Draft, Zibanejad in the 2011 NHL Entry Draft). Though they share some similarities in their stat lines, each player brings a different skillset to the table. That being said, this is a smart hockey trade for both sides. The Ottawa Senators are getting a consistent veteran point-producer in Brassard, who led the Rangers in goals last season with 27. 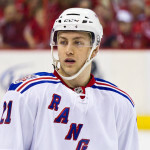 Brassard tallied a total of 69 goals in his three-plus seasons on Broadway, second only to Rick Nash (91). Brassard’s 174 points in that time rank third on the roster behind Derek Stepan (182) and Mats Zuccarello (176). Brassard, a former first-round pick (6) in the 2006 NHL Entry Draft, was acquired by the Rangers in April 2013 as part of the Marian Gaborik trade. Brassard has three years remaining on the five-year, $25 million deal he signed with the Rangers back in the summer 2014. His $5 million cap hit is a reasonable price tag considering the added benefits Brassard brings to the table, namely his playoff experience and veteran leadership. The Sens are also getting a player who is excited to be playing for his hometown team. 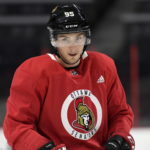 Though starting over on a new team always presents challenges, Brassard will have an advantage in that he is familiar with several players on the team. “I know a lot of guys. I was skating with them in the summers,” Brassard said. “I got to know [defenseman] Cody Ceci and [forward] Mark Stone at the World Championship this summer. I got along with those two guys really well. I know [forward] Mike Hoffman from junior, I know [Jean-Gabriel] Pageau from living in Hull and kind of grew up in the same city as him. Brassard also has familiarity with the Senators’ new bench boss, Guy Boucher, who coached Brassard in junior. This move by the Senators demonstrates the organization’s interest in making the playoffs now rather than continuing to build the team’s already-impressive core group of talent. Brassard is the type of player who can step in and make an immediate difference. Brassard, 28, has 127 goals and 343 points in 563 career regular-season games with the Rangers and Blue Jackets. He has scored 18 goals and 44 points in 59 career playoff games over the past four postseasons. The New York Rangers entered the offseason knowing that adding speed and youth to the lineup was a priority for the club moving forward. This past offseason featured a disappointing first-round exit for the Rangers, who had put together numerous competitive playoff runs in recent years, including reaching the Eastern Conference Finals two years in a row and a Stanley Cup appearance in 2014. But after this postseason, it was clear that the lineup had grown stale, and changes were in order. Acquiring Mika Zibanejad is the first step in shaking things up and bringing younger skill to the roster. Zibanejad fits the bill as a speedy, skilled 23-year-old center who can also play wing. The Swedish forward set career highs in games played (81), goals (21), assists (30) and points (51) last season. He has 64 goals and 151 points in 281 career regular-season games, as well as two goals and eight points in 16 career playoff games, all with Ottawa. He is also five years younger than Brassard. Additionally, Zibanejad won 50.5 percent of his faceoffs this past season. Though Brassard finished with an almost-identical percentage of 50.4, Zibanejad’s faceoff percentages have improved by two percent in each of the past two seasons. If Zibanejad can continue to improve his faceoff percentages, he would provide an enormous boost to a Rangers team that has been consistently over-matched in the faceoff circle in recent years. This past year, for example, the Rangers finished 23rd in the league with a combined team faceoff percentage of 49.2 percent, according to PuckBase; the team finished 28th in the 2014-2015 season. Logistically, Zibanejad gives the Rangers a little more cap flexibility, as he has one year left on his two-year, $5.25 million deal, which carries a $2.625 million cap hit. He will be a restricted free agent with arbitration rights next summer, but this move gives Rangers general manager Jeff Gorton around $2.4 million to work with this offseason. Theoretically, re-signing Zibanejad to a deal that carries a smaller cap charge than Brassard’s $5 million is certainly possible, though it’s not an issue that needs to be dealt with in the immediate future. The extra $2.4 million could be used to sign restricted free agents Chris Kreider and Kevin Hayes, it could allow Gorton to make other trades or it could be used to add a player via free agency. But at the end of the day, this deal was not just about the cap for the Rangers. 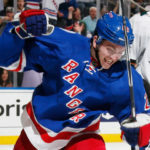 As Gorton expressed, this move injects youth and speed into a Rangers lineup that is in desperate need of a jump-start. It would be surprising if this is the last move out of New York before next season. 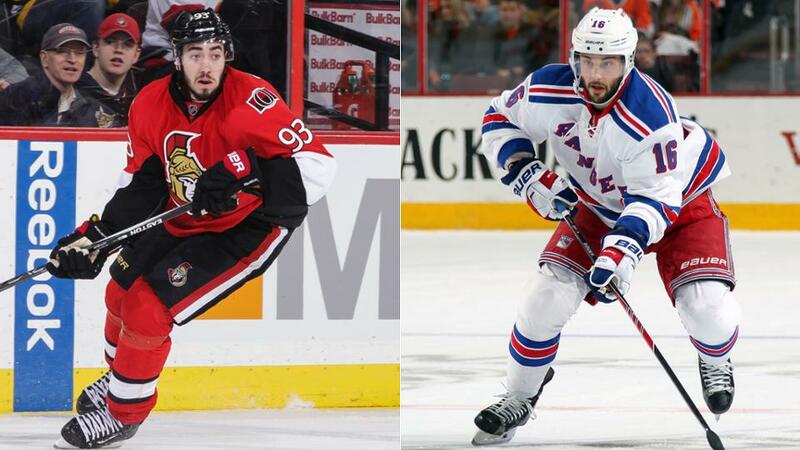 Derick Brassard and Mika Zibanejad are both coming off strong seasons. Both players are former first-round Both players have their strengths and weaknesses, and those strengths and weaknesses make this trade a sensible one for both sides. The Senators get a more experienced and polished player who can make an immediate contribution and help the team reach the playoffs. The Rangers get a younger and faster player with more upside, a little more cap flexibility and a high draft pick, something the team has been without over the past several years. Both players are in a position to excel in their new roles, making this a smart hockey trade all around.